Today is Day 8 of the Happiness Challenge! It’s time to break out those thank you cards again. This time it’s to appreciate someone in your department for doing something to help you or your team. Looking back at Day 2 of the Happiness Challenge, we offered tips of to make sure the activity didn’t take too long to complete. Also, to make sure the note was effective by being specific, timely, and genuine. Today, we’ll offer some ideas to help you compose the note. As a refresher, if you read out first post that introduced the 20-day Happiness Challenge you know that I identified 5 different activities. These 5 specific activities are chosen because of the impact they will have for you. And a positive impact on the person that’s receiving the benefits of your action. 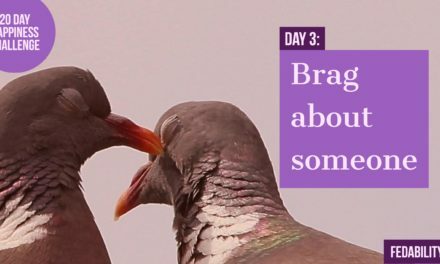 To make it easier to do the challenge, we’ve created a 20-day calendar for this challenge. You get the calendar for FREE if you sign up for the FedFan newsletter. 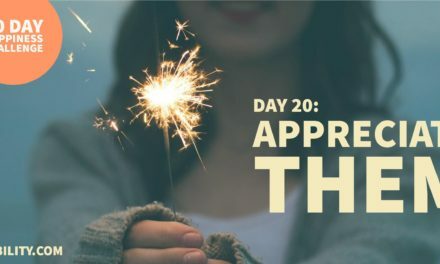 While Day 2 of the Happiness Challenge asked you to write a thank you note for a team member, this one takes you a little further outside of your day-to-day network, but not too far. Writer’s block is no reason not to appreciate someone today! If you’re like me, I sometimes get ‘writers-block’ when I try to write thank you notes. No matter how much I genuinely appreciate someone, it’s hard to put it into words without sounding too generic or too cheesey. So, I suggest checking out Brandon Gaille’s post that has a ton of template thank-yous to start you off. I wouldn’t use most of them as-is, but they’re good to get your brain muscle pumped up. So for example, a template thank-you from Brandon Gaille is: Your contributions matters to this company. Your hard work will surely take the company to the highest level of success. Thank you, for all that you have done. As it stands, the template is not specific enough. So try this: Your contributions (On what?) matters to this company (pick one: me, the team, my office). (pick one: I/We) appreciate your hard work (or creativity, patience, insight, etc). Because of your assistance, (what will or has happened?) will surely take the company to the highest level of success. Thank you, for all that you have done. If you still want some assistance on writing that note, check out Hallmark’s thank-you template suggestions. If you scroll about 3/4 of the way down the page, there’s templates for professional relationships. One I like is: Thank you for your invaluable mentoring these past three months. I’ve had fun getting to know you better, and I’ve learned so much from talking with you and seeing how you work. You are amazing at what you do! I’m grateful to have had the chance to work with you so closely. As I mention in all of these Happiness Challenge posts, the hardest part of keeping on track with a challenge is the accountability and support to keep on going. I hope you’ll follow along with me and the other Fed Fans that are participating. I also hope that you’ll share your successes with us either on twitter #happieratwork or on the Fedability facebook page. You can find me on twitter @danaesims_iopsy. Or, you can leave a comment in the space below. 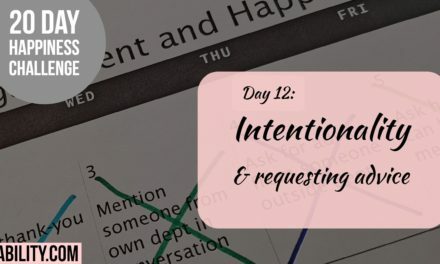 Did you miss Day 7 of the Happiness Challenge? Go back to the post on giving positive feedback to someone on your team! 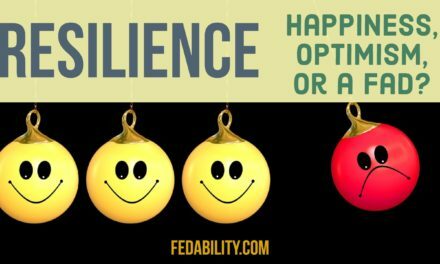 Resilience: Is it happiness, optimism, or a fad?